I’m a big believer in not always having to be so serious with your invitations. So if you’re thinking of having a little fun with your designs, you’ve come to the right place! Still, you may wonder if it’s possible to take a playful idea and make it elegant. I’m here to reassure you that it is! Just look at the invitation suite we created for Elizabeth and Matthew, whose wedding was spun together by the fabulous event planner Jill La Fleur. The couple was getting married in Ojai, California, which is famous for its oranges. Given that the bride loves everything from the fruit’s scent to its color, we thought we would use the iconic citrus as inspiration and truly personalize the results. For a bit of fun, we riffed on the classic orange joke by adding the line “Orange You Glad You’re Invited” to the save-the-dates and incorporated the actual color into the more formal, flourish-filled invitations. See the whimsical but elegant results here. We couldn’t resist continuing the playful mood in this week’s issue, so make sure to check out the orange-themed items in this week’s Get the Look. Plus, if you’re still jonesing for more bright color, take a look at Sephora’s fun new collection of beauty goodies, inspired by Pantone’s recently revealed “Color of the Year,” Tangerine Tango. 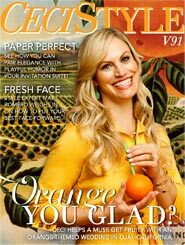 Orange you glad you’re reading this issue? V91: GET THE LOOK – ORANGE YOU GLAD? Let your wedding invitations exceed your dreams. The ones we created for Elizabeth and Matthew took a whimsical orange theme to elegant new heights (various prices, cecinewyork.com). Just in time for greenmarket season, Kate Spade brings wit to the basic straw tote ($245, endless.com). Go for something a little different on your toes using Essie’s Orange, It’s Obvious nail polish ($6.90, amazon.com). Don this bright, slinky dress from Donna Karan and stand out from the crowd (donnakaran.com). Send a playful message at your next party with these striped paper straws from Sip Sticks ($11.97, sipsticks.com). Framed in cheery orange, Cutler and Gross’s oversized sunglasses make a sunny statement ($475, net-a-porter.com). This old-fashioned Orange Blossom Brand art print ($9.99, amazon.com) would be fun to frame and hang in the kitchen. Crave a glass of freshly squeezed OJ this minute? There’s no tool easier than this large orange juicer ($14.95, surlatable.com). Bring the bright essence of orange to dishes both sweet and savory with a few drops of Nielsen-Massey’s Pure Orange Extract ($5.95, surlatable.com). Turn your backyard into a mini fruit orchard with this easy-to-move Blood Orange Patio Tree ($69.95, harryanddavid.com). Invitation suites with personality are a sure way to get your guests’ attention and build excitement. Personally, I’m always thrilled when I get to work with a client who embraces being unique and loves to have a little fun with their designs. But can you be whimsical even if you’re planning a formal wedding? Of course! My advice: do it with your save-the-dates. They’re the perfect opportunity to do something less formal; you can always follow with a more traditional invitation. Take, for example, what we did for Elizabeth & Matthew. To have some fun with their orange obsession, we played off the typical “Orange you glad?” jokes and put “Orange you glad you’re invited?” on the cover of their save-the-date booklet. When guests opened the envelope, they couldn’t help but smile. Each page followed with personal messages from the couple and all the details of their wedding weekend in Ojai, California, set against a backdrop of vintage orange crate labels! Even the cover was made of wood-grain embossed paper alluding to the wooden orange crates. Love these kinds of details! The invitations that followed were made to look more elegant. Our team hand drew the couple’s names in flourished calligraphy and designed an intricate family crest that incorporated all their personal details. We kept the orange theme going through the ink color and playful little icons on the RSVP card. For the welcome note that guests received when they arrived at the Ojai Valley Inn & Spa, we brought back the vintage orange crate label theme and greeted guests with the line “Orange you glad you’re here?” to put them in a happy mood for the weekend. V91: CECI CREATIVE TIPS – EMBRACE COLOR: TANGERINE TANGO! As a graphic designer, I consider Pantone’s inks an essential part of my design work. Every piece I create incorporates a Pantone (or PMS – Pantone Matching System) ink in it. So naturally when I saw that Pantone and Sephora were collaborating on a line of products inspired by Pantone’s “Color of the Year,” Tangerine Tango – and thereby combining my two loves, color and beauty – I was beyond excited. In keeping with our orange theme this week, I couldn’t resist sharing it with you. Just in time for spring and summer, I encourage you to check out these products. They’re all available on Sephora.com, and the price points make it easy to jump right in. I always love buying a bright new coral lip gloss for the season, and this year I’m definitely going to give one of the choices below a try. I’m thinking Tangerine Tango for my toes, too. Live life in color! PS: For those of you who want to bring this ink into your printed invitations, I recommend PANTONE 172U. Just tell your invitation designer and they will be really impressed you are speaking their language! Have fun! Take the time to set up meetings with industry professionals and choose to work with people that “get” you. Planning goes much smoother when you don’t have to worry about explaining what your version of “rustic elegance” looks like. Know your overall concept and what will be important to you before hiring your team, then be open to input and insight from your vendors – they do it for a living! We really wanted to show why Ojai was important to us – it is where we met and attended high school. The invitations, the red barn and orange groves at the rehearsal dinner and reception were exactly what I imagined thanks to the creative direction of the talented people who made our wedding happen. For me, being a Ceci Bride was so much fun and one of my favorite parts of wedding planning. We knew what a great impact invitations can make leading up to an event and we wanted to ensure guests had the right information to make travel plans. Ceci perfectly helped us package the practical and the decorative for our wedding. Being from out of town, I found the design process easy via phone conversations and electronic proofs. I loved that Ceci got exactly what we wanted with the first drafts – it’s as if she read my mind! As you can see from the beautiful makeup Mar Romero and her crew at TEAM Hair & Makeup have done for Elizabeth’s wedding (in these gorgeous images shot by my friend Jose Villa), Mar knows a thing or two about making people look effortlessly beautiful. I asked her if she could share with us her top five everyday beauty tips that we could all try at home and she agreed to let us in on her secrets! I don’t know about you, but I’m definitely trying the braided bun for work. And even though it sounds crazy, I’m going to whip me up a batch of that avocado-and-beer hair remedy and give it a try ASAP! See below for more. Thanks, Mar, for sharing. Mar Romero, a fourth-generation Latina, was raised in San Diego, California, with dreams of becoming a makeup artist. She began her career in the mid 1990s, working as a national makeup artist for major cosmetic lines, including Bobbi Brown and Christian Dior. Mar quickly advanced into TV, independent films, commercials, and photo shoots. In the late 1990s, Mar was asked to do makeup for several Oscar nominees at the Academy Awards. Soon after, these high-profile celebrities began recommending Mar to friends and relatives for special events and weddings. It was then that Mar began to turn her focus towards the wedding industry. Using her artistic talent and creative vision, Mar launched TEAM Hair and Makeup in 1999. Mar has traveled to the Virgin Islands, Mexico, Bali, Italy, Hawaii, and Central and South America to style fashion shoots and weddings. Through perseverance and dedication, Mar has transformed herself into a master of her trade. Quick hairstyle: Want that I’m-not-even-trying hair? Dampen your hair with water and mousse, then braid your hair tightly into a ponytail and wrap it into a bun and pin. Take your blow dryer and dry your hair for three minutes on high heat, then unfold your bun and braid for some beachy waves without the fuss! Hair treatment: Dry ends? Here’s a natural way to get sleek, shiny hair! Grab two avocados, a can of beer (don’t drink it!) and an egg and mix them together. Once blended, massage the mixture into your hair and slip on a shower cap for 30 minutes. Rinse and condition for a smooth, healthy-looking do! Moisturizer: Before applying foundation, always prep the skin with an oil-free moisturizer to ensure your skin glows naturally all day. Lips: To ensure your lipstick lasts all day, remove all gloss, chapstick or makeup and apply lipstick on a bare lip, then blot and reapply. Eyes: For a natural “smokey” look, toss out any dark shadows and replace them with a light shimmer shadow to sweep across your lid. Using a gel liner in black or black/brown, line the inside of your waterline and then smudge out with your finger for a natural, sultry eye without all the drama! Escape to this historic resort of casual elegance featuring luxury accommodations, Spa Ojai, and a championship golf course. Use this palette as a stepping stone toward creating your own dream event. Click on the color swatches to see how the colors come to life at a real event or discover more inspiring color stories now. V91: DON’T MISS – MARTHA STEWART WEDDINGS FEATURES CECI NEW YORK! MARTHA STEWART WEDDINGS FEATURES CECI NEW YORK! Ceci New York designed the playful save-the-date booklets and elegant invitations for this elegant and rustic wedding in Ojai, California. Semolina flour (pasta flour) is available at better supermarkets and at Italian markets. Bring sugar, honey, cardamom, and 3 cups water to a boil in a medium heavy saucepan, stirring until sugar dissolves. Arrange orange slices in a single layer on prepared baking sheet; remove cardamom pods and seeds. Preheat oven to 350 degrees F. Brush pan with oil. Whisk both flours and next 4 ingredients in a medium bowl. Using an electric mixer, beat 1/4 cup sugar and 1/2 cup oil in a large bowl for 1 minute. Beat in yolks, then flour mixture. Beat in yogurt, zest, and vanilla. Using clean, dry beaters, beat egg whites in another medium bowl until soft peaks form. Gradually beat in remaining 1/4 cup sugar until firm peaks form. Fold egg whites into batter just to blend in 2 additions. Transfer to prepared pan; smooth top. Bake cake until a toothpick inserted into center comes out clean, about 25 minutes. Pierce hot cake all over with a metal skewer. Slowly drizzle 3/4 cup warm syrup all over. When syrup is absorbed, slowly pour 3/4 cup more syrup over. Reserve remaining syrup for serving. Run a thin knife around edge of pan to release cake. Remove pan sides. Arrange candied orange slices over. Sprinkle pistachios over. Cut into wedges and serve drizzled with more syrup. V91: DON’T MISS – WIN A $4,500 TABLETOP SHOPPING SPREE WITH NEWLYWISH! LAST CHANCE TO WIN A $4,500 TABLETOP SHOPPING SPREE WITH NEWLYWISH! As you may already know, NewlyWish is running an exciting contest to help you restyle your tabletop: one lucky winner in their Registry Re-Patterned Sweepstakes will receive a $4,500 shopping spree to use toward chic china, crystal and giftware from Waterford Wedgwood on NewlyWish.com. Renowned for their fine china and crystal for more than 250 years, Waterford and Wedgwood have also partnered with a number of leading innovators in the wedding and design worlds, including Vera Wang, Monique Lhuillier, Jasper Conran, and John Rocha, to name a few (click here to check out all of their beautiful products on NewlyWish). I was invited to assemble my own assortment of dishes from these existing lines. I was so excited to spend an afternoon at the WWRD showroom and have my pick of whatever designs I wanted to mix and match to create my own Ceci collection of dishes. Whatever your mood, this collection allows you to make a personal style statement at your table. See the images below and click here to add to your own registry. And as a special gift to our CeciStyle readers, you’ll receive a special bonus entry. What could be better than that!? 1. Visit the NewlyWish facebook page and follow the Sweepstakes button. BONUS: Enter referral code CECI2012 in the sweepstakes entry form to receive an additional entry! 2. Create a registry on NewlyWish and be automatically entered. The sweepstakes ends on April 24, 2012 and the winner will be announced on May 1, 2012. Enter now and lock in your entries before time runs out! Sign up for CeciStyle now! Ceci Johnson, Founder and Creative Director of Ceci New York, is the authority on style and invitation design. She is also the author of her highly coveted weekly style magazine, CeciStyle. Loaded with gorgeous tips and takes on invitations, fashion, parties, weddings, décor, gifts and more, CeciStyle is free and full of trusted, time-saving advice. Posted on March 26th, 2012 by Kate. Filed under Real Weddings. For Frank and Marbella, their stunning, coral and gold wedding was like a dream come true. We’ll say, for us too! We’re sooo in love with their album. It’s easy to tell that every detail was perfectly planned and executed by Liz at Central Coast Memory Makers…from the vibrant palette to the cocktail reception overlooking the ocean. Many thanks to the talented Michelle Warren for sharing these amazing photos with us! The day started with pampered beauty in the bridal suite by TEAM Hair & Makeup. Marbella’s best gals helped her into the exquisite Amalia Carrara gown, which was fit for a princess. The bridal party lit up the photos in coral colored statement dresses with pleated ruffle hemlines. It was an unforgettable ceremony at Our Lady of Mount Carmel Church in Montecito, followed by a cocktail reception overlooking the beach on the terrace of La Pacifica Ballroom at The Four Seasons Resort in Santa Barbara. The reception was the picture of luxury and elegance, indoors at The Four Seasons. Camilla Svensson Burns designed the most incredible florals- the room was decked out in pale pink and gold tones. Read the bride’s story just below and catch the full feature in our Real Weddings Gallery! Paper Goods & Favor Boxes by Letter Perfect & Paper, Ink. From the Bride: They say if you want to make God laugh, tell him your plan. We were introduced by mutual friends. A month prior on Frank’s 39th Birthday celebration, he announced that he would never get married, it simply wasn’t for him. I was too busy trying to finish my MBA degree and wasn’t interested in finding love just yet. Upon introduction, Frank claims he fell in love instantly and swore to himself that if he didn’t marry me, he would never marry anyone. I inevitably fell in love with Frank’s romantic style, AMAZING personality, and wonderful sense of humor – anyone who knows Frank knows there is never a dull moment! One week before our Wedding, the weather in Montecito was gloomy and cloudy. However the day of our wedding, we couldn’t have been blessed with better weather, it was beautiful, and sunny! The day started off with the hair and make-up team arriving to do all the ladies hair in the Bridal Suite. I didn’t worry about a single thing; Liz (our wedding coordinator) took care of absolutely everything! The ceremony took place at the most beautiful little church in Montecito. I was walked down the aisle by my 94 year old grandfather, with a small picture of my Father in the bouquet. The Mariachi Band played the traditional Mexican wedding music. It was a beautiful ceremony by Father Edward Jalbert. When it was time for us to kiss, Frank took my face in his hands and our foreheads met for what ended up being a brief, yet unforgettable moment full of emotion. The day was truly a dream come true for us both. The reception was absolutely stunning. The cocktail reception was held overlooking the ocean on the terrace of La Pacifica Ballroom at The Four Seasons Resort, The Biltmore. It is months later and we are still overwhelmed with comments of that beautiful cocktail reception. Traditional music was played by the Mariachi, a Trio, and then to get the party started, the wonderful “Impulse” Band played. The dance floor was never empty! We danced our first dance to “At Last.” Frank forgot everything we had rehearsed for our first dance, except for the beginning and the end, so we just improvised! It turned out to be a beautiful dance. After that heartfelt speech, there wasn’t a dry eye in the room. The rest of the night was full of fun with the photobooth and all the dancing, starting with the song “Tonight’s gonna be a good night”- the song people would catch Frank singing whenever he was going to take me out in the months we were dating.